Designed for the serious audiophile, the Westone W30 uses separate bass, mid-range and high frequency balanced armature drivers in conjunction with an advanced 3-way crossover for a truly awesome listening experience. Westone's 50+ years of experience with in-ear applications has yielded a low-profile, lightweight, universal earpiece which delivers maximum comfort and in-ear coupling for dynamic transfer of sound. A replaceable cable connection includes the braided EPIC cable and round MFi cable with 3-button Apple Control System and mic function, including volume +/- , tracking +/- , phone answer, and Siri activation. Westone's balanced armature drivers are significantly more compact and efficient than traditional dynamic drivers. By combining multiple balanced armature drivers with sophisticated crossover networks, Westone monitors provide enhanced sonic detail and a frequency range that extends well beyond typical in-ear solutions. Exchangeable black, blue and red color faceplates are included with secure attachment. Each set of W30 in-ear headphones comes with an EPIC replaceable cable and MFi G2 cable, premium comfort tips, mini-monitor vault, cleaning tool, and 2-year warranty. The Mini Monitor Vault is constructed of a high-impact polymer and is the perfect size for travel and storage. The Westone W30s are ideal for listening to hard rock, alternative, electronica, R&B, funk, country, ska, and punk, delivering amazing reproduction of recorded/mastered music in a universal-fit earphone for the serious audiophile. 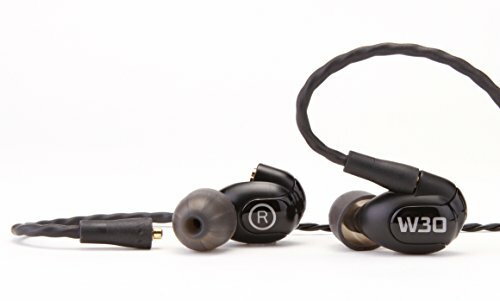 Make sure you try all the eartips provided to find the correct fit and comfort for you. If the eartip is too small and doesn’t create a complete seal inside your ear canal you will lose low end frequencies. Choose the largest tip that is still comfortable for you. You may even need a different size tip for each ear. Make sure the right earpiece is worn on the right ear and the left earpiece on the left ear. The earpieces are marked, and when worn the cable should point to your front and wrap around to the back of your ear. TRIPLE BALANCED-ARMATURE DRIVERS WITH THREEWAY CROSSOVER: The Westone W30 features three balanced-armature drivers with a 3-way crossover, and delivers sophisticated and detailed sound, with balanced lows, mid-range, with crystal-clear highs. The neutral response of the W30 delivers incredible clarity and definition in recorded and mastered music.